The frame features a 4" single pedestal post and 3" support arms designed to offer comfortable, convenient and accessible elevated seating. 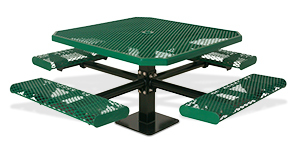 Frame is powder-coated while the tops and seats are sealed in an ultra durable polyethylene finish. These octagon diamond pattern steel tables are a great choice to provide outdoor seating in public and commercial areas. Built ready	for continued exposure to the seasonal elements, engineered for user friendliness. Surface and in-ground mounting options available with two, three and four attached seats and all stainless steel hardware.